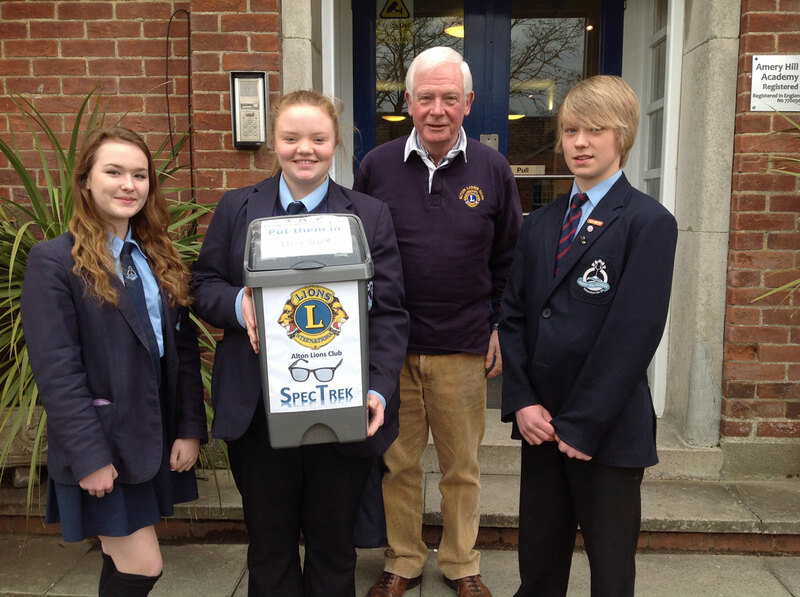 Alton’s Amery Hill students Naomi Mulligan, Emma Court, and Matt Cranstonfrom, who are all participating in the LIONS Young Leaders In Service (YLIS) Project being led locally by Alton Lion Derek Shaw, deliver a bin full of spectacles they have collected for the Lions Spectrek programme. Spectrek is one of the great global recycling projects organised by Lions Clubs International and involves collecting and redistributing spectacles no longer required by the owner to new users in developing countries. Millions of people in developing countries have uncorrected refractive errors (near-sightedness, far-sightedness or astigmatism) that can be easily diagnosed and treated with corrective lenses. For children, clear vision means a better education, healthier development, for adults, it means greater employment opportunity and economic strength and for seniors it means less dependence on others and it costs Lions Clubs less than 5p to supply a pair of recycled spectacles to change someone’s life. Spectacles collected in Alton are sent to a location in the UK for sorting, cleaning, grading and shipping directly to developing countries where local Lions Clubs organise the testing and distribution. Previous Previous post: Keep the Momentum Going!